You are currently browsing the tag archive for the ‘Marrickville LGA’ tag. Inner West Council have given notification that they have removed a Small-Leaved Peppermint (Eucalyptus nicholii ) outside 73 Station Street Petersham. “Tree was in poor condition with structural root instability. Active termites & advanced internal decay at base. They say they will replace this tree with a Spotted Gum (Corymbia maculata) in the 2017 Street Tree Planting Program. This sign was installed by Marrickville Council. I think it is laughable that a large organisation who has purchased another organisation, completely changes the way they do business and then after enraging the community, decides to do community consultation. This is what is happening with Ausgrid, which is owned by the NSW government. Prior to Ausgrid, we had Energy Australia managing our electricity supply. The business name has changed, but not the service the company provides. It’s like having a deli on the main street for 60-years. Then the business is sold & it continues to operate as a deli, except under new management. For 60-years this deli was famous for selling a wide range of quality cheese. However, the new owners chose not to have a wide range of cheese, only stocking cheddar for sale. It’s still a deli, but what it offers has changed. Now that might not be the best analogy, but this is what I feel has happened with the transfer of management of Energy Australia to Ausgrid in terms of street tree pruning. Energy Australia pruned the street trees on a 7-8 year cycle. Ausgrid prunes the street trees on an 18-month cycle. Does this mean that Energy Australia provided an inferior & dangerous service to the community for all those years? I don’t think so at all. While Energy Australia was not immune to butchering street trees, they did not do it as a matter of course. 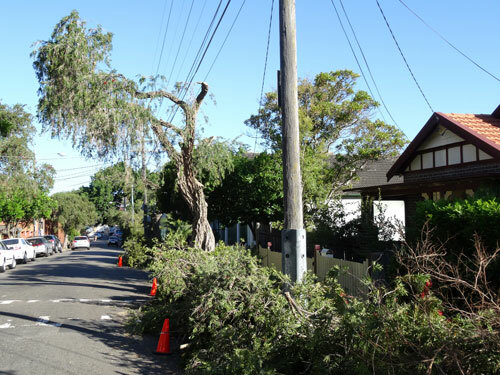 Since Ausgrid has taken over management, the state of street trees all over their area of control in Sydney is deplorable. It’s not unusual to see the street trees in sections of streets looking as though they have been through a war. And the community has been complaining loudly. 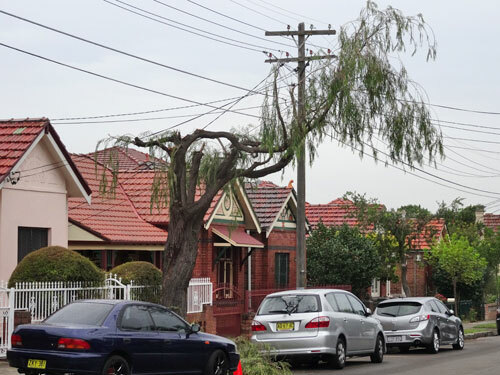 After their initial round of pruning, it appears that Ausgrid do a few street trees in a street, then come back at a later date to do the others. I presume this is to somewhat mitigate the look of destruction it leaves behind. Ausgrid calls what it does “tree trimming.” I would debate this. “Trimming” sounds gentle & nothing like the savage butchering well below the service cable for Pay TV & even further below the electricity cables. IMPORTANT: I would like to state clearly that I am not focusing on or criticising the workers who do the tree pruning. They do what the company tells them to do to. Ausgrid clearly has different opinions on what is safe clearance from electricity cables than did the previous energy supplier Energy Australia. Yet, we did not have electrical fires breaking out all over the place, as is the explanation for the brutal tree pruning on Ausgrid’s website. We are keeping you safe is their message & that is hard to argue against unless you ask why Energy Australia managed to prune the street trees differently & still keep us safe. Ausgrid needs to expand on their perception of “safe.” Increasingly researchers all over the world are publishing about the urban heat island effect, deaths from heatwaves, mental health deterioration & increased respiratory illness & fatal heart attacks in areas that have a poor urban forest. The street where I live had street trees that reached the top of the power poles for the two decades that we have lived here & it was the same for all the streets around us. There were no fires. There was no loss of power supply. Service was stable & all this through a number of major storms, including the incredibly damaging hail storm in April 1999 & the major storms of June 2007 & February 2010. Ausgrid took over from Energy Australia in March 2011 & my street is a shadow of its former self. We lost shade, we lost beauty (because our street trees were beautiful) & we lost bird life. We are now a street with power poles poking metres above savaged street trees & every time Ausgrid visits, more branches are lost. the least green space in Australia – so we are not getting much benefit from trees in parks unless we go to the parks on a regular basis & stay there for a while. Land lots are small & often not suitable for a decent sized tree. 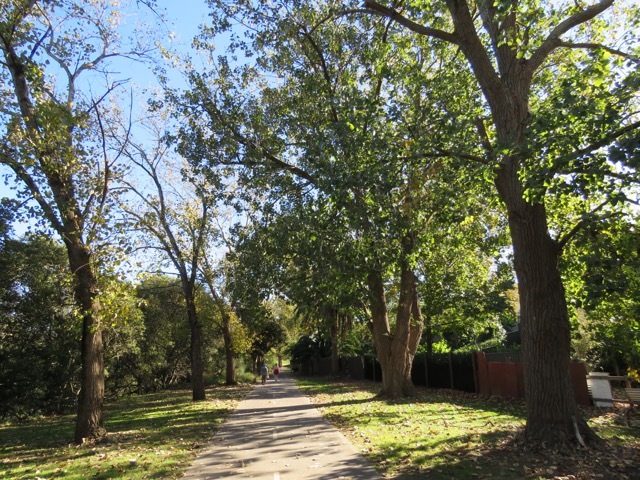 Therefore, the dependence on street trees – green leafy streets – is substantial in the Inner West. In 2015 Marrickville municipality was rated “poor” in terms of its urban forest with a canopy cover of just 16.3%. Marrickville was also also found to be the unhappiest community in Australia according to Deakin University’s Australian Unity Wellbeing Index. Can poor happiness levels relate to the lack of canopy, to poor street trees & to the lack of green space? Yes, I believe it can & that it does. 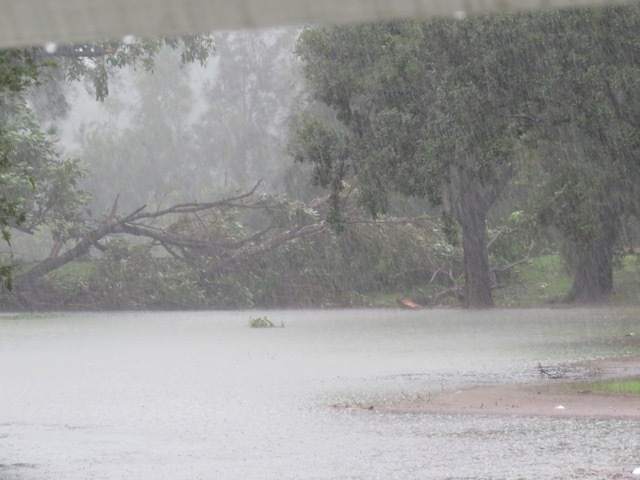 So, with all this in mind, think about the impact Ausgrid’s new street tree pruning practices are having on our urban forest & how this flows on to the community’s health, our increased risk of a range of illnesses & disease starting from childhood & even death. It is a serious public health issue & I have not even mentioned climate change yet. Climate change is breaking all the records for increased & unseasonal temperatures. Every year it is harder to be out on the streets in the middle of the day. If we don’t have sufficient street trees with a decent canopy, then we are going to suffer. We are already suffering. Some of us will die from the heat. It is as simple as that. This is truly alarming & should be also alarm the NSW government. They constantly tell us that they are terribly worried about the cost of caring for people who have Alzheimer’s disease. Particulate matter from air pollution has been shown to significantly increase incidence of this disease. So what picks up harmful particulate matter? Trees of course! So once again, street trees are a public health issue. If the government wants to get control of the increasing health care costs of the community, they should provide local councils with the funds to greatly increase the urban forest. This spending will, as the trees grow & start to become more useful, start to impact on all kinds of health issues ranging from obesity, respiratory & cardiac illness, depression & Alzheimer’s disease. It’s a no brainer. Provide sufficient funds to allow suburbs with poor canopies to start to look like other more wealthlier suburbs across Sydney. Often the housing is similar – it is the streetscapes that are radically different. We already know that poorer suburbs tend to have less tree cover. I’ve often wondered whether it has been a deliberate initiative to keep some suburbs more affordable by having less tree cover & unattractive streetscapes. Unfortunately, this is being blurred by the soaring housing costs in Sydney where even a shabby house in an unattractive street is being purchased for $1 million plus. Even so, I think some might use housing prices as their argument why I am incorrect in my observations. I say to the NSW government – instead of whinging on the nightly news about how the government will pay for health care in an ageing population, take action to give people the quality of life while they are living, from the cradle onwards. Give them a decent urban forest with a great tree canopy cover, so that the air that they breathe is not harming them by creating a range of physical & mental health issues. Keep many of the community out of hospital by making our city green. Now Ausgrid is showing that they are listening to the myriad complaints from both the community & local councils by holding community consultation via a working group. And as is usual with community consultation, if we do not participate, then it is business as usual. Any further complaints are met with – well we held community consultation & didn’t get much in the way of negative feedback, so what can we do. We are keeping you safe…blah, blah, blah. The working group will meet four times between August & December 2016. So, if the state of the street tree pruning bothers you (It bothers Marrickville Council) & if you care about your own & your family’s health, take up their offer & leave feedback at the Inner West Council – council@marrickville.nsw.gov.au Then Council will have something from the community to take to these meetings. If enough of us participate, we may actually be able to effect positive change, though it may take decades for some of the trees to look good again. 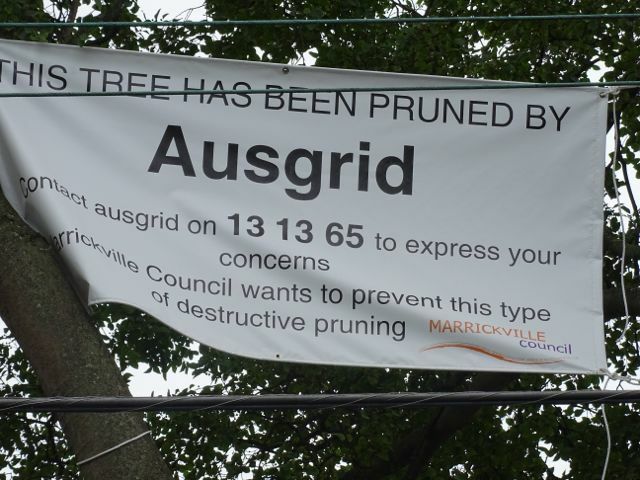 I hope that Ausgrid does more than listen & that it makes significant changes to its tree pruning standards. Sydney needs street trees now more than ever with Sydney’s population over 5-million. Trees, the urban forest canopy will become more important than ever. Most of the canopy is on the ground. I was thrilled to see six good sized Queensland Brushbox trees planted along the west side of Livingstone Road near Marrickville Park. Not only will these trees improve the streetscape, but they will also visually lead the eye to the park. Big canopy street trees is totally appropriate for this wide road. I was also pleased to see that Council did not remove the red flowering gum trees planted along here. Although these trees could be deemed a failure because they range from around 1-metre to 1.8-metres tall after 5-years of growth, they still flower every year & provide food for wildlife. The same Illawarra Flame tree, but with aerial bundled cables on either side. 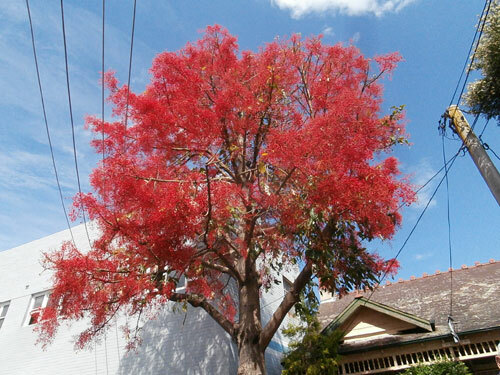 In my last post I showed an old photo of mine of an Illawarra flame tree in Marrickville. It is one of my favourite trees in this street. When it flowers it is magnificent. Yesterday I drove past this very tree & noticed something that made me happy. 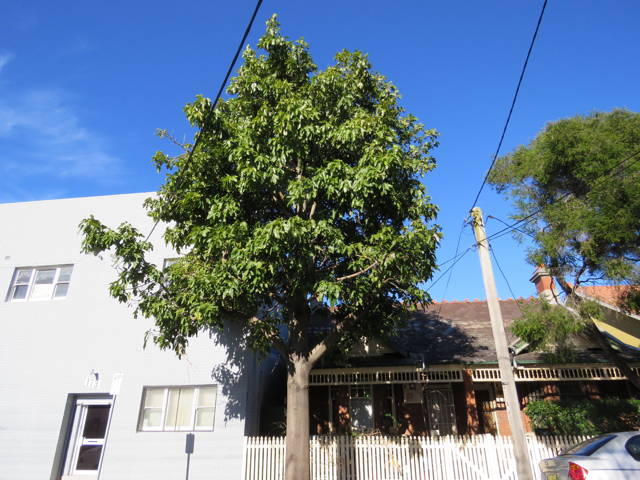 Marrickville Council, before being amalgamated, had organised with the power company Ausgrid, to protect this tree by installing aerial bundled cables on either side of the canopy. The before & after photos appear that the tree wasn’t pruned to install the cables. Now this gorgeous tree can continue to grow & be a landmark tree in this area, without needing to be pruned in the manner that has become usual for street trees in Sydney. A big thanks from me to both Marrickville Council for organizing & I presume paying for the cabling to be installed & to Ausgrid for doing this. I think it was money well spent. Very large rain garden in Alice Lane Newtown. Photo was taken 2 months ago, so it should be looking better now. 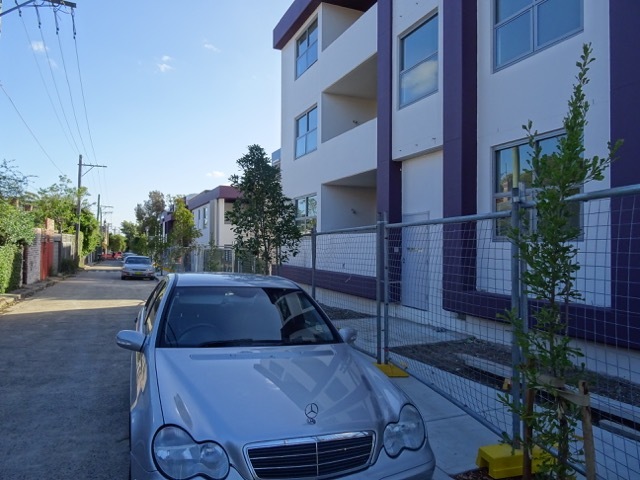 The new high-rise housing development on Alice Street is nearing completion. I am pleased to see that all the street trees have been protected. It was nice to see the shadow pattern of dappled leaves over balconies knowing that whoever lives there will look out onto the canopy of these trees & enjoy the shade, green & birdlife. My bet is the outlook onto mature trees will be used as a selling point. Behind this building in Alice Lane I counted 20 new trees planted as part of the development. One species looks to be Banksia with another species planted with every alternate tree. At the corner of Pearl Street & Alice Lane they (I am assuming this work was done by the developers) have built a large rain garden. It looks great & will only improve as the plants grow. It is obvious that planning has included making it an informal meeting place where people can sit & chat. On the wall of the house that sits beside the rain garden in a very nice nature-themed mural painted by @mulgatheartist. 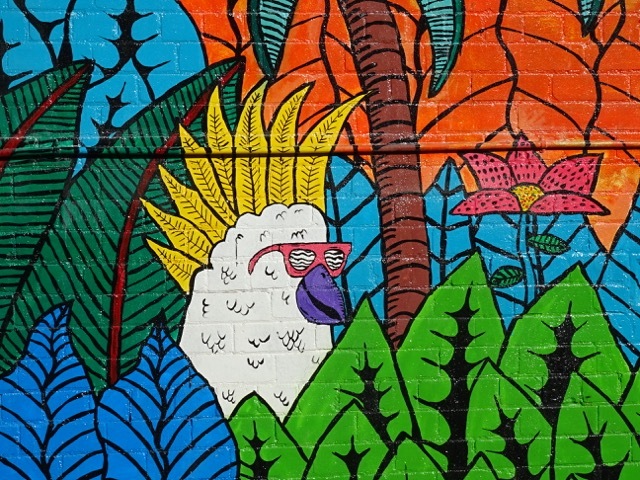 The outlook is ‘groovy tropical’ with Australian native birds looking hip wearing sun glasses. It’s sweet, funny & a bit whimisical. I like it a lot & I especially love that it is nature-themed. Improvements like this help with stormwater & clean the water before it reaches the Cooks River, even from this far away. The raingarden, new trees & mural also help soften the landscape, plus add beauty & a patch of habitat in a hard landscape. Street art by @mulgatheartist. The whole mural made me laugh. 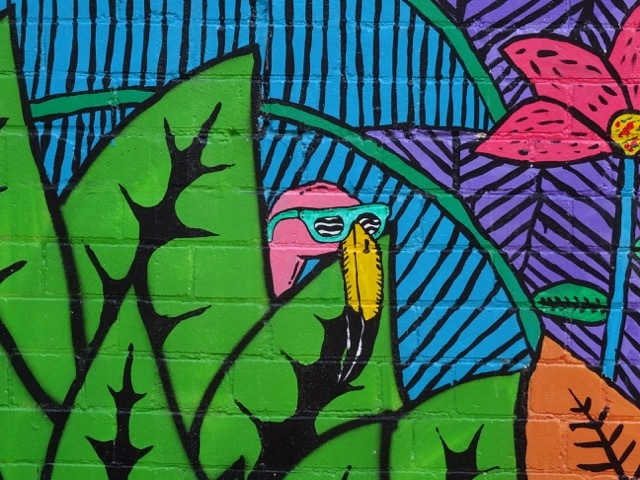 Shy flamingo – part of the mural. 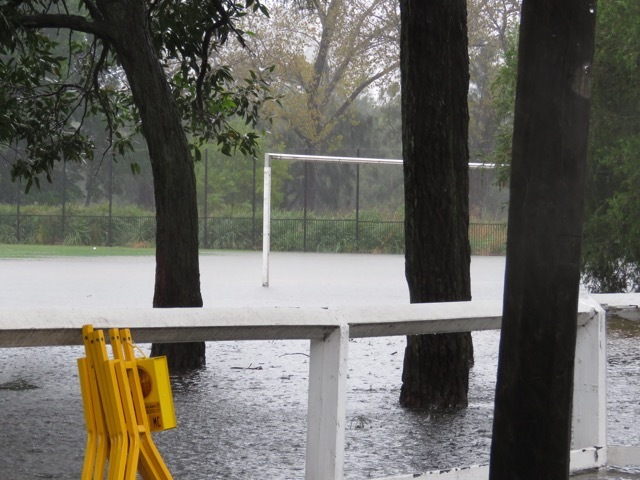 This is a series of posts about Inner West Council’s plan (nee Marrickville Council) for all the parks along the Cooks River, except Tempe Reserve. I have not covered all of what Council intends, just those areas that are environmental initiatives or those that interest me. The link to download the Plan is below. Mulch & plant natives under the heritage fig trees. Create an equal access path from Thornley Street to Richardson’s Lookout. Revegetate the unusable area surrounding the Cooks pine. Build a native vegetated swale to the existing low point at the eastern end of Warren Park. Do bank stabilisation works & “ant-scour” on steeper slopes. I do not know what ant-scour means. 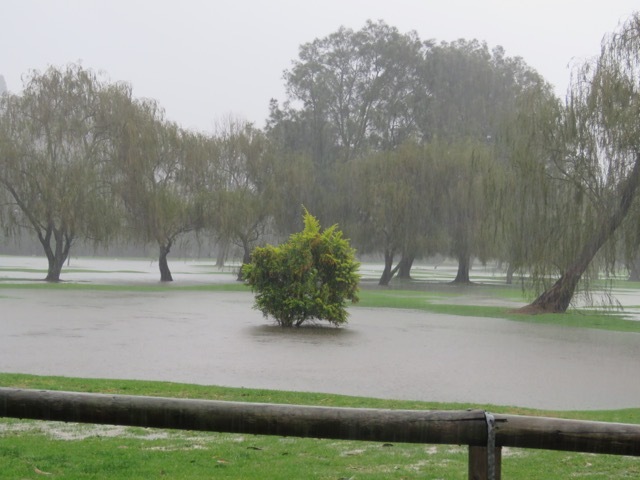 Build a vegetated detention basin prior to the Cooks River. The fencing between Warren Park & Thornley Street will be removed & native grasses & other local native plantings planted to act as a barrier between the park & the road. A failing retaining wall will be replaced with stone or similar. Biodiversity opportunities will be incorporated into wall design. More re-vegetation will be done along the river foreshore. Build a river-viewing pontoon or jetty constructed from steel mesh or similar. Install night lighting along the share pathway. Richardsons Reserve and the Cooks Pine. 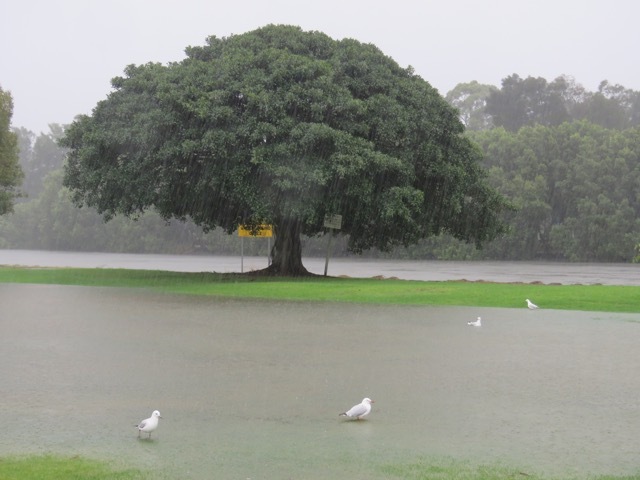 Council plans to plant vegetation in front of the riverbank to stop the community having access to the river – yet this is where many sit to enjoy a picnic with friends, read a book, chill out & watch the river. The fence you can see carries on for many metres past following the path & keeps children from running from the playground to the path or the river. It should be enough. Why should the community miss out on being able to sit beside the river? There are so few places where we can do this along both sides of the river without having a fence, mangroves or something in front to prevent this. I find this part of the plan very sad & hope Council changes their mind. 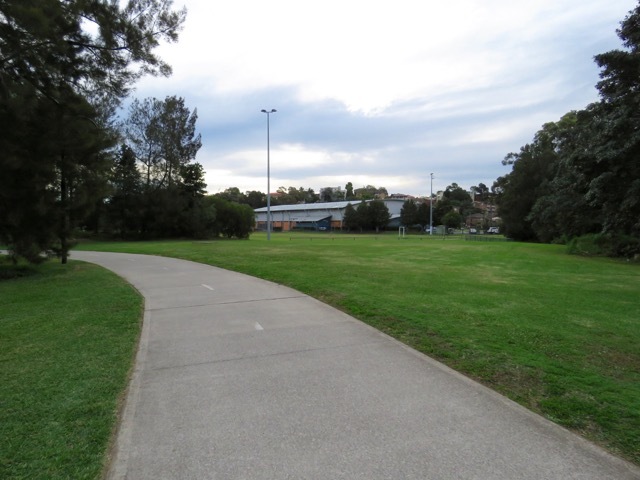 Add more concrete paths to “help with existing desire lines & increasing recreation opportunities.” One will be a 1.8-metre wide path to Thornley Street from the current shared path along the grass next to the cliff up to Thornley Street. Our Council loves laying concrete in parks. What is good is the plan for new trees around the flying fox, the water play park & between the play facilities & the ball net. New trees also for around the exercise equipment & the proposed water treatment wetland. New trees are also planned for the slope near Thornley Street. It would be nice to know the number of trees planned, but any new trees are a boon for this park. The lower branches of the Casuarina trees along the foreshore pathway will be removed to increase sight lines & ground covers planted. Grasses, groundcovers & small shrubs will be planted alongside residential properties. Grasses & groundcovers to be planted beside the car park. 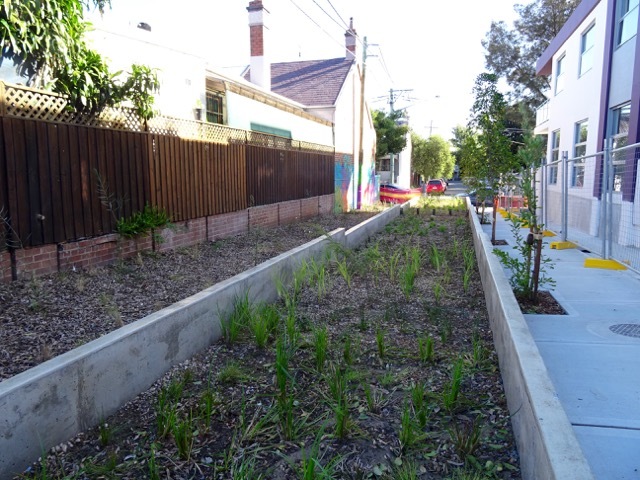 New rain gardens a minimum 2-metres wide will be added to the car park & planted with local native sedges, grasses & tree plantings. 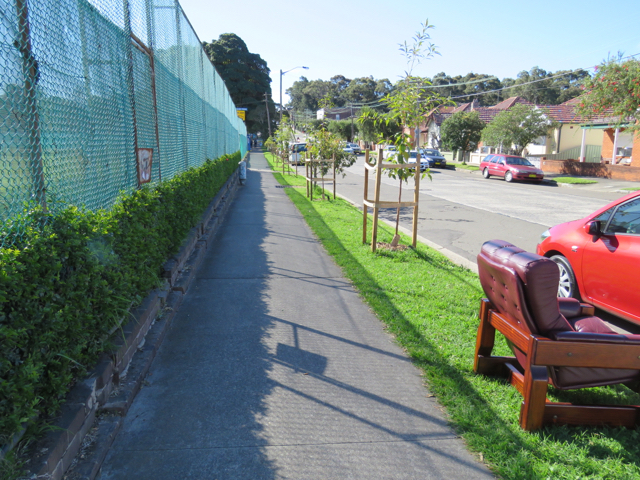 13 new seats will be placed along the edge of Illawarra Road & behind the Debbie and Abbey Borgia Recreation Centre. 5 concrete “block style” seating will be placed in the patch of grass near the house on the slope next to Thornley Street. There will be another barbeque installed next to the playground with a shade structure. The playground will be expanded with new equipment that has a nature based theme. That’s nice. The fence around the northern playing field will be removed. New bike racks installed near the exercise equipment. Upgrade the playing field with new turf & drainage. 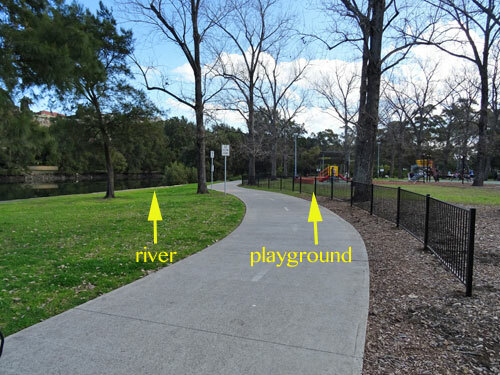 And sadly, Council plans to plant vegetation infront of the river “to limit water access by users.” I would have thought the extensive fence between the shared path & the children’s playground & barbecue areas would have been sufficient. Frankly, the plan to cut off access to the river makes me feel sad. To stop people being able to sit at or near the river’s edge is a BIG LOSS to many in the community. Plenty of people like to sit here on picnic blankets & watch the river. A 1.8-metre wide path will be installed on the left of the photo to the trees in the distance & up the slope to Thornley Street. The fence will be removed & seats installed. The playing field will be upgraded with new turf and drainage. Poplar trees in Steel Park. 10 trees outside the playground area will be removed. Poplar trees in Steel Park to be removed. I have been reading the extensive document – ‘Cooks River Parklands Plan of Management & Master Plan’ released for community consultation by Marrickville Council (now amalgamated with Leichhardt & Ashfield Councils & given the ultra boring name of Inner West Council). 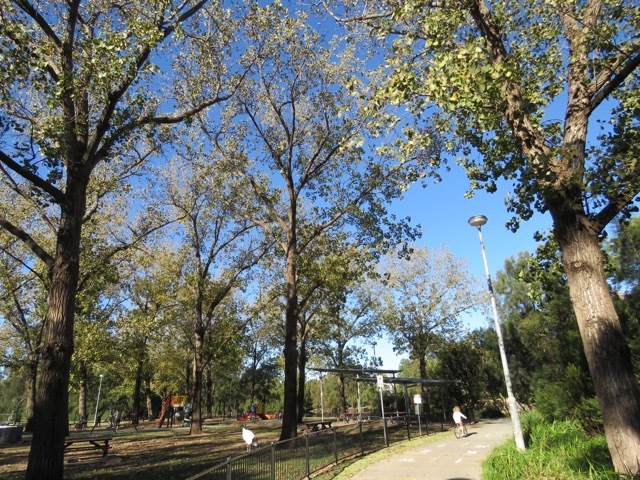 While I will go through this document in more detail, I thought it is important to make a single post about Council’s intention to remove most of the Poplar trees along Marrickville’s section of the Cooks River. This amounts to the removal of 27* trees & Council are doing this in a time of climate change when every tree is important, especially tall, mature broad-leafed trees with significant canopies. * My count could be incorrect. I counted 12 Poplars along the Cooks River Foreshore, 10 trees in Steel Park outside the playground area & 5 others in Mahoney Reserve. 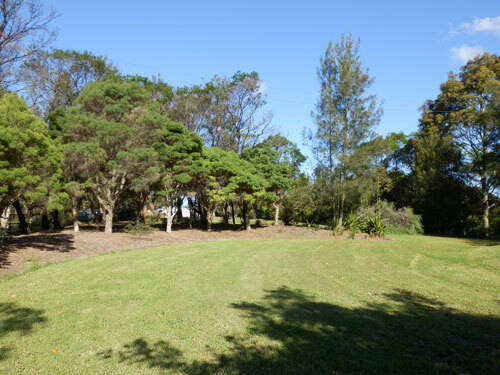 I did not include 23 trees in the Steel Park playground area, nor the 8 trees along the shared pathway at Mackey Park or the 4 trees on the Illawarra Road side of Mahoney Reserve. 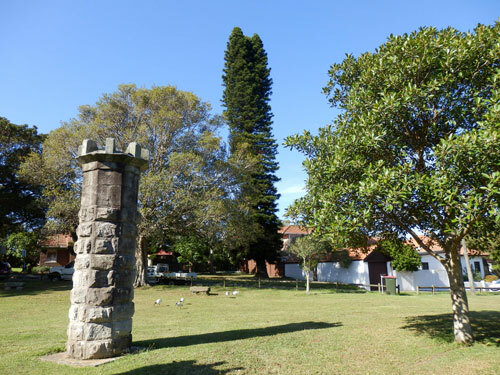 All Poplars will be removed in Mahoney Park, except for the four trees adjacent to Illawarra Road. Three are mature, one is small. The same is planned for Steel Park, except for the existing all “structurally sound” Poplar trees located in the children’s playground. It will be interesting to see how many of these trees will be deemed unsound & removed. 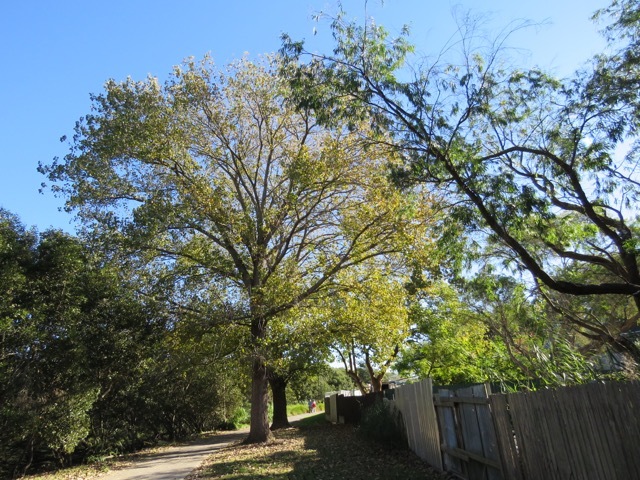 5 Poplar trees to be removed in Mahoney Reserve. The trees behind are mature Fig trees, which gives you an idea of the height of these trees. Council’s report says that the Poplar trees beside the river “are damaging water quality and adjacent plant communities.” Such a grand statement, yet no information for the citizen who might care to know more. tall dense structure can provide a visual screen for site aesthetics & habitat value.” I am glad they mentioned habitat because these trees are full of feeding birds. I’d suggest the massive & regular use of Glyphosate sprayed all over the municipality & importantly right at the river’s edge in all parks & along the Marrickville Golf Course would have a higher negative impact on water quality than these Poplar trees. Give me trees over pesticides any day. 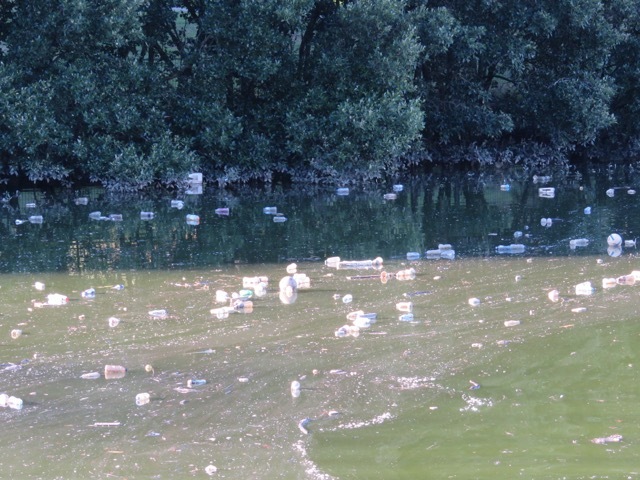 You can also see my post, “The Cooks River is crying’ http://bit.ly/1TUMwy8 showing some photos of the appalling floating army of filth in the river last weekend to see what the real water quality is like. Will the removal of a few Poplar trees along a small section of the river actually make a positive impact on the water quality of the Cooks River when this is happening? Seriously? Photo taken 15th May 2016. Not only bottles and other litter, but look at the oil. 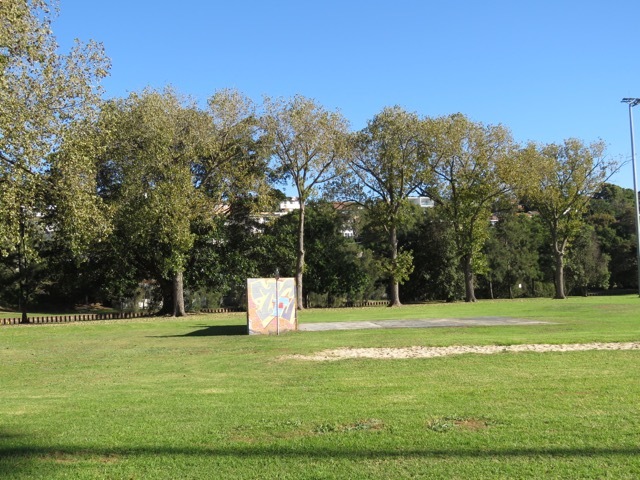 At Mackey Park the report says, “Implement recommendations for existing trees as per the Marrickville Open Space Tree Inventory 2015.” However, there is no mention of the Poplar trees in Mackey Park. The Poplar trees along the shared pathway at Mackey Park with the river on the right. In February 2014 a post was made by someone on Facebook about the rumour of the removal the Poplars at Mackey Park. I contributed what I had previously been told by Council. The discussion clearly expressed community opposition to the removal of these trees. It is my understanding that it is illegal in NSW to remove trees because of leaf & other litter, but it seems this is not the case for local councils. I would suggest that if the Poplars are affecting water quality, then so would the Poplars in Mackey Park. It seems contradictory to remove some, but not all of the trees. The two new seats are being used daily & looking through a section of trees to the river does not lessen the experience. There are many people who actually like trees as part of the view. Not everything needs to be like watching television. I sat on both seats & they both have a clear view to the river. Plus, Council plans to install picnic tables next to the river, so there will be uninterrupted views of the river from these seats. Marrickville municipality has had enough pruning of public trees in my opinion. Trees pruned to look like poles with foliage on top are not very attractive trees, except for palm trees & they are supposed to look like that. All around the world trees are being hacked at, vandalised or removed for views. These trees will continue to grow & their pruned trunk will get more pole-like as they grow taller. The shade they produce will also be less. The outcome was that one branch was pruned from one of the Fig trees. It doesn’t sound much of a deal, but the removal of just one branch amounted to removal of approximately one-quarter of the canopy. This tree only had 6 branches & a major branch of the canopy was removed. 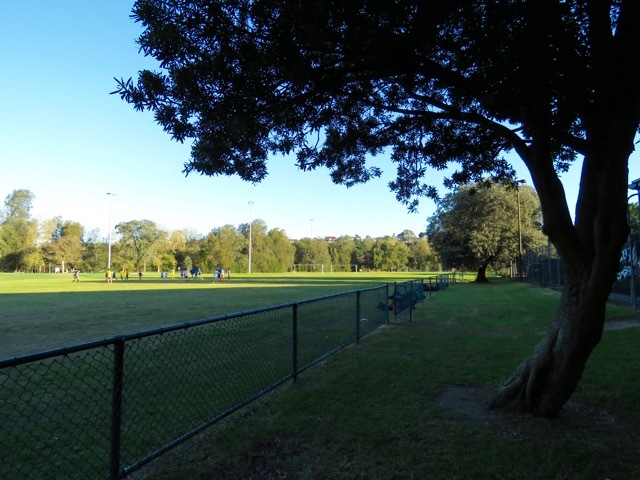 Only in Marrickville is a spot of shade not allowed on the corner of a playing field. Cross the river & you will see parts of many playing fields affected by shade. Sunset is on the river side so actually the shade of these trees moves towards the river & therefore should not cause a problem for the field, except for early morning games. 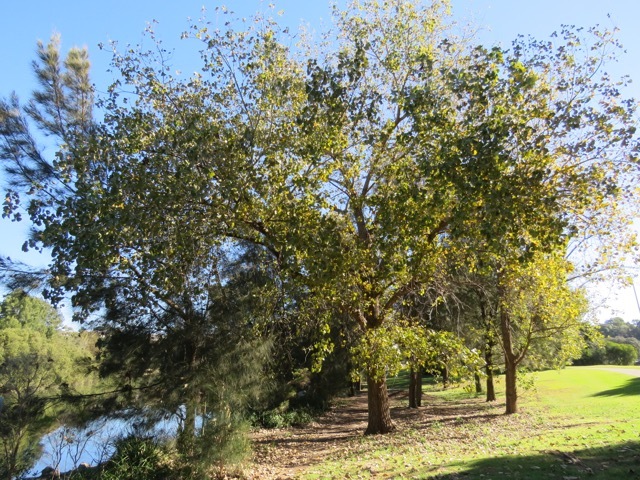 If Council really wants to know how the community feel about the Poplar trees, I would suggest that they employ a couple of market researchers to simply ask all the passers-by at Mackey Park & along the Cooks River Foreshore how they feel about the Poplar trees. I firmly believe that they will hear again & again how much the community loves these trees. Of course they will get a few people who don’t like the trees, but I believe the feedback will be overwhelmingly positive towards these trees. They are unusual in that they are big tall trees with big fat trunks. This is a local rarity, except for some Fig trees. They not only look great & produce lovely dappled shade, the leaves also sound wonderful in the breeze. This sound is an almost instant stress reducer. The trees mark the seasons in an extravagant way. They lose their leaves & we crunch them under foot or under bicycle wheels. In spring the lime green leaves appear & the catkins flower. Their dappled shade is incredibly lovely in the parks & they cool the shared path & Steel Park playground in summer. When you enter Steel Park on a hot summer’s day, the positive impact of these trees is palpable. When they shed their seeds the ground looks like it is snowing in summer & it is lovely to see. And no, they are not spreading new trees all over the area or even in local bushland at Wolli Creek. In contrast, the Casuarina trees are spreading like wildfire. Even though these are beneficial native trees, managing their suckering spread by pruning the lower branches as stated in the Plan does not seem like the best management in my opinion. I am all for native trees. In fact, I prefer natives, but I oppose removal of the few remaining Poplar trees along the Cooks River. There is plenty of room for more tree planting & these should be native trees. One last thing, the Poplars are full of birds & they provide a lot of food for them. It saddens me that Council plans to use a large chunk of the allocated $15 million to remove mature trees. Everything possible should be done to retain healthy mature trees because they are vital in the management of climate change. 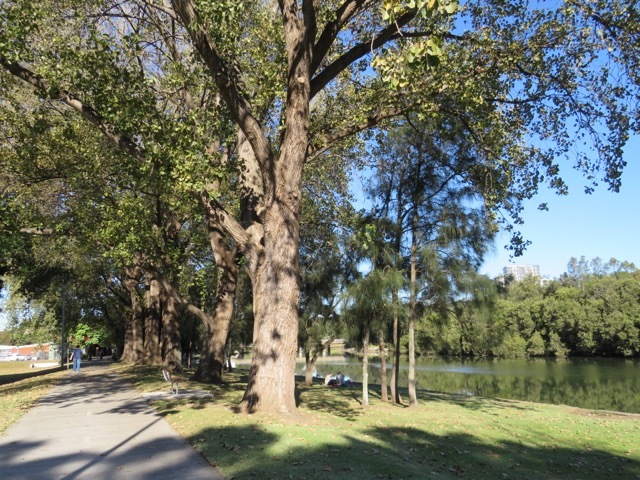 I will be writing more about the Plan for the Cooks River Parklands. There are some excellent initiatives & I feel sad that I have concentrated on the negative aspects in this post. Poplar trees along the Cooks River Foreshore. Poplars are deciduous, so they have lost most of their leaves. This is a glorious place to walk, especially in summer. Lots of birds, cool dappled shade and much beauty. It is unthinkable to lose them. Two more Poplars along the Cooks River Foreshorten be removed. These trees will look grand. 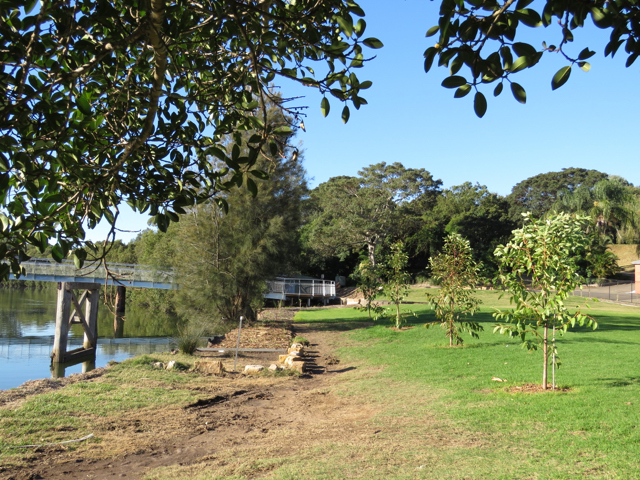 It was excellent to see four more new trees in the newly created garden beside the new bridge across the Cooks River at Marrickville Golf Course. 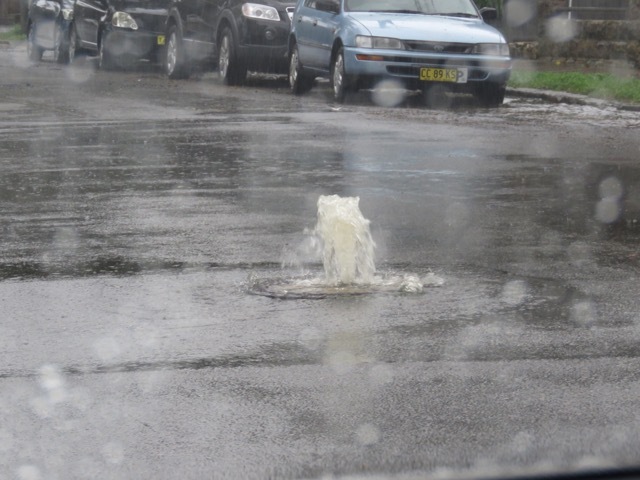 Thank you Marrickville Council.